I received most of the parts used for mounting the radios inside the vehicle today. Though I ordered both short and long Ram arms from Amazon, they ended up sending two long ones, so I’m starting a return and ordered the short one again. The short arm will bring the radio to the right of the GPS in quite a bit, to the point where they are almost touching. I do like how the mounts are bolted to the dash instead of clipped to the plastic, and though the metal is thin it’s a lot more stable than the previous ones I used for the GPS. 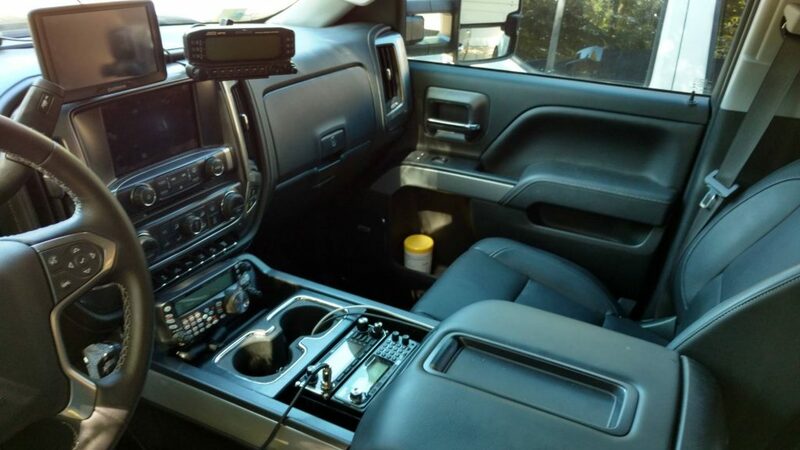 The GPS and TM-D710G are both on PanaVise brackets that bolt into the dash, and the GPS is bolted directly the mount while the TM-D710G has the RAM mount bolted in-between. Test fitting the TS-480HX I realized that I could mount it to the side and both retain the rubber boot in the bottom of the tray and access the 110v outlet that I use. It worked out perfectly.